You may remember by love/hate but mostly love relationship with the Ultrabland cleanser from Lush a while back. Well, as the sunshine started to tentatively peek from behind the clouds, my skin started to do what oily skin does in summer - slip and slide comes to mind! This is when I usually start to up my exfoliation game in order to keep the oil under control. After an obligatory chat with a sales assistant in Lush, she recommended I give their Angels on Bare skin exfoliating cleanser a try. Angels on Bare skin is based off an ancient mediaeval recipe, perfect for the Game of Thrones obsession I’m currently going though. Made with 100% natural ingredients; kaolin, almonds, rose water, lavender and chamomile blue, it’s designed to combat sensitive, oily skin, brightening as it goes and soothing any and all inflammations and redness. I was assured by the sales assistant that I could use this every day as it was so gentle, but everyone's skin is different so you might want to play it by ear a little. I started off using this as my go-to evening cleanser. 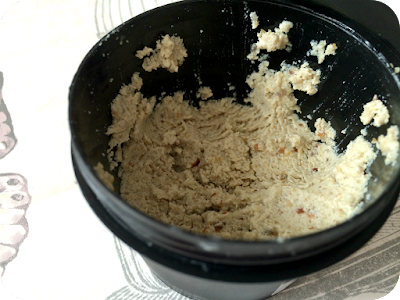 The cleanser itself is in solid form, with the consistency of week old, congealed and crusted porridge. Thankfully it doesn’t smell like old crusty porridge. 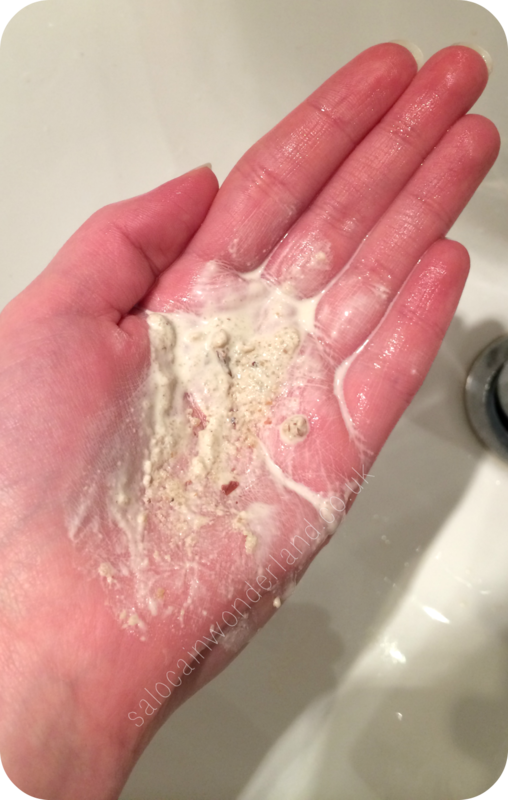 After removing your makeup and rinsing your face with lukewarm water, take around a 50p sized lump of cleanser and massage it into you palm with your fingers until a white milk forms and the solid cleanser melts to a more malleable, butter-like consistency. The white milk is almond milk which tones and brightens the skin. One you have your paste, start to apply it to your face in circular motions. You can really feel the little exfoliation granules, but because of the cleansers consistency, no matter how much I work it in my hands before applying it to my face, I still find bits of it pinging off all over the bathroom. After working it into the skin for a minute or two, you can leave it on like a face mask for 5 - 10 minutes, allowing the almond milk to soak in and soften your skin. I do this maybe once a week? It really does leave my skin feeling extra soft. Most nights, I remove it with my trusty Washi hot cloth. My pores look clearer and my skin, overall looks brighter and feels much softer. Cleansing like this every day in the beginning did keep my oily skin at bay, but after about a fortnight of us, my skin started to feel really tight and dry after cleansing and I noticed my skin was getting oilier during the day. Like I said, play it by ear, some people's skin will happily take the daily exfoliation, others, not so happily. Instead of using it every night, I use Angels on Bare Skin around 3 times a week which seems to be working in my favour. 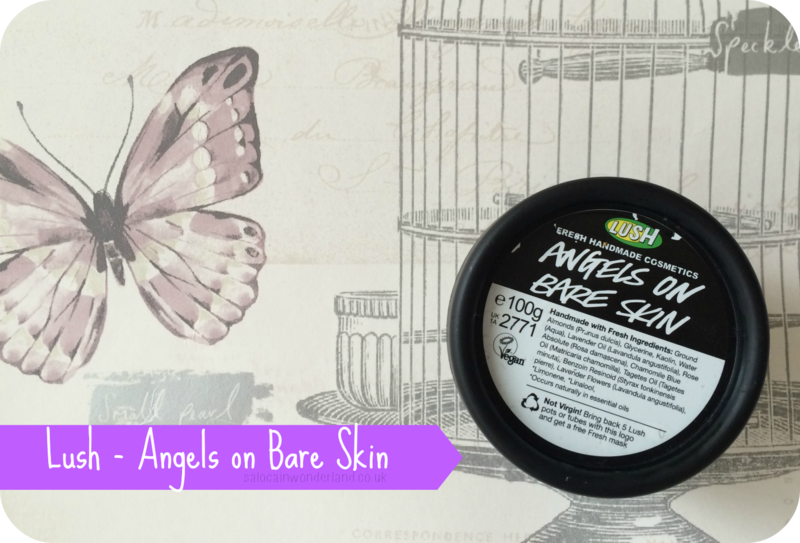 One upside, they say Angels on Bare skin is not only for face, but for body too, so with Summer just around the corner, this actually makes a great body scrub - you just won’t get as much bang for your buck! What’s your go-to exfoliator? Let me know in the comments below! This seems rubbish and I hate the obligatory chats with the sales assistants in lush.I always struggle to get exfoliators off my face properly and find bits in my hairline for days. NO GOOD. Eek I hate finding bits of it in my hairline, especially the bits you don't notice until they've dried in! I love this but I can never manage to get through a whole tub before it goes off. I think I might be using TOO much, but I lose that much of it during application, that's probably why I'll use it before it runs out. I was surprised they don't seem to sell it in smaller tubs like they do most of their other cleansers. Sounds like a great product, I'll keep it in mind. Messy but well worth a try! I'm always cautious to use products like this as I have extremely sensitive skin! I find these lush types products to be quite expensive but I might give it a try! You never know, it could do me wonders!?! Your blog is super pretty btw!